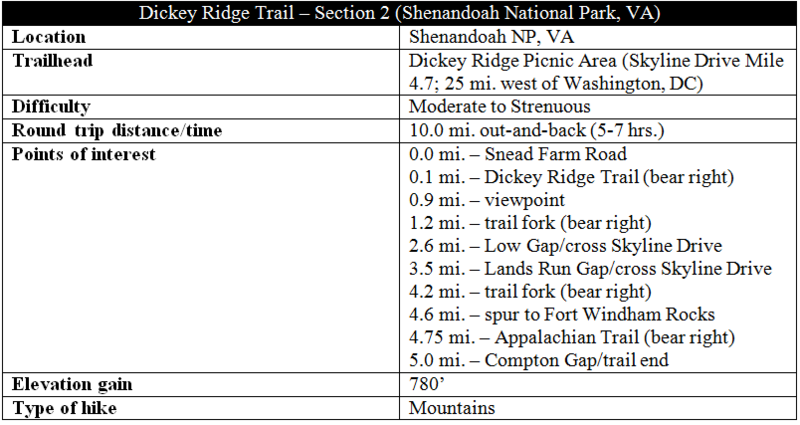 Reach the trail’s start by heading for the Dickey Ridge Picnic Area, situated just south of the Dickey Ridge Visitor Center around mile marker 4.7 on Skyline Drive. Park near the southernmost end of the picnic area (accessible only by a one-way, southbound drive from the Visitor Center). Look for a well-trodden dirt path heading south, past the picnic tables, which quickly crosses the one-way road, then spits out at Skyline Drive. Cross the busy, two-way scenic byway to reach the trail’s start: a partly paved service road known as Snead Farm Road. Walk down the road as the pavement turns to gravel, then continue to a 4-way junction as the singletrack Dickey Ridge Trail crosses the road. Bear right, heading uphill on the root-laced path. After 3/10 mile on the Dickey Ridge Trail, a brief respite from a steady climb offers hikers the opportunity to catch their breath. It is only fleeting, however, as the ascent continues, cresting at around 8/10 mile after about 450 feet in elevation gain. To the left, through the woods, is the summit of Dickey Hill (2,444’), the highest point on Dickey Ridge. From here, the trail levels off and approaches the highlight of the hike: a break in the woods that gives way to a terrific overlook of Browntown Valley, Mount Marshall (3368’), Hogback Mountain (3,474’), Gimlet Ridge (2,103’) and Mathews Arm (2,272’). 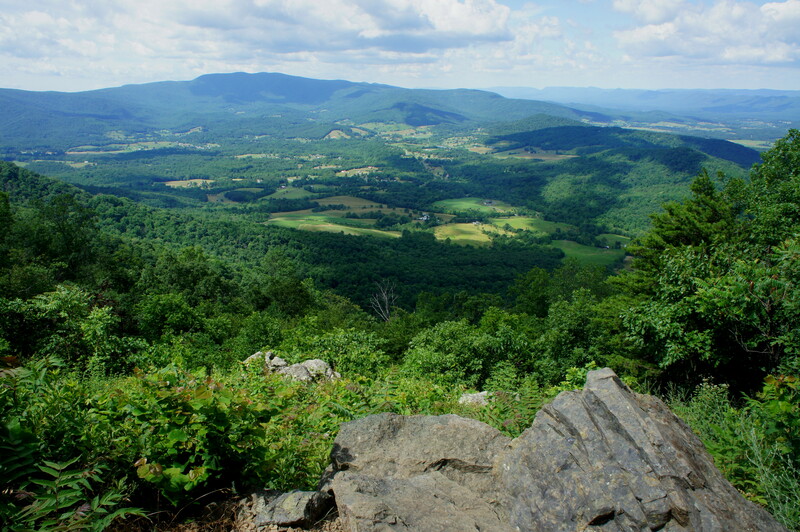 Massanutten Mountain dominates the landscape to the west, across the Shenandoah Valley. An abundance of greenstone at the viewpoint offers a place to sit down and enjoy the vista. Once ready, continue back into the woods as the trail hugs the west flank of Dickey Hill. A well-worn social trail climbs the hillside to the left (ending at the summit). Beyond, the Dickey Ridge Trail settles into a steady descent, dropping to a junction with the Snead Farm Trail at 1.2 miles. Stay straight, with Skyline Drive within earshot to your right. For most of the next 1 ½ miles, hikers will gradually lose more than 400 feet in elevation. Cross Skyline Drive at Low Gap, 2.5 miles from the start. 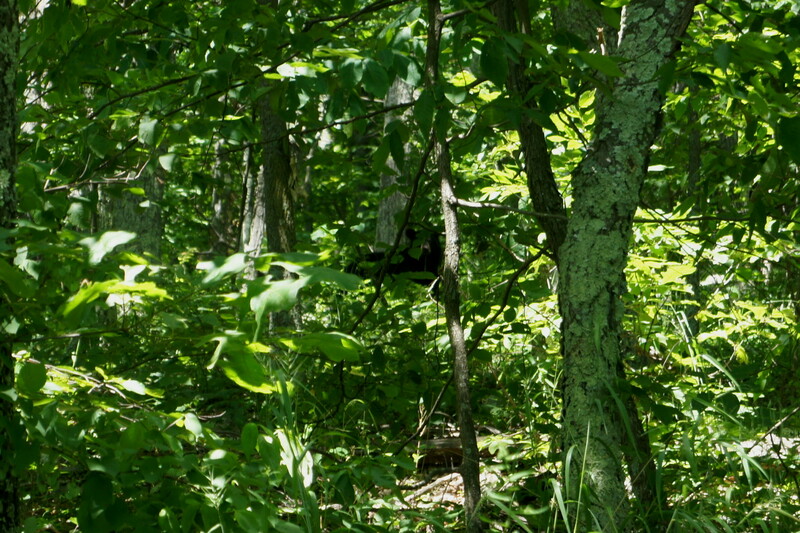 Across the road, look for an unmarked but evident trail that plunges into the woods on the other side. Follow this path as it weaves east to a junction at 2.6 miles; stay straight. (Note: the trail to the right is unmarked but likely leads down the mountains to Browntown Valley.) From here, uphill climbing returns with a vengeance. Round a bend at 3.1 miles, after which the grade lessens. Minutes later, the trail drops again to cross Skyline Drive again, this time at Lands Run Gap. The trail emerges from the woods at the parking lot for Lands Run Falls (situated less than a mile’s descent from here). The hike continues across the road. 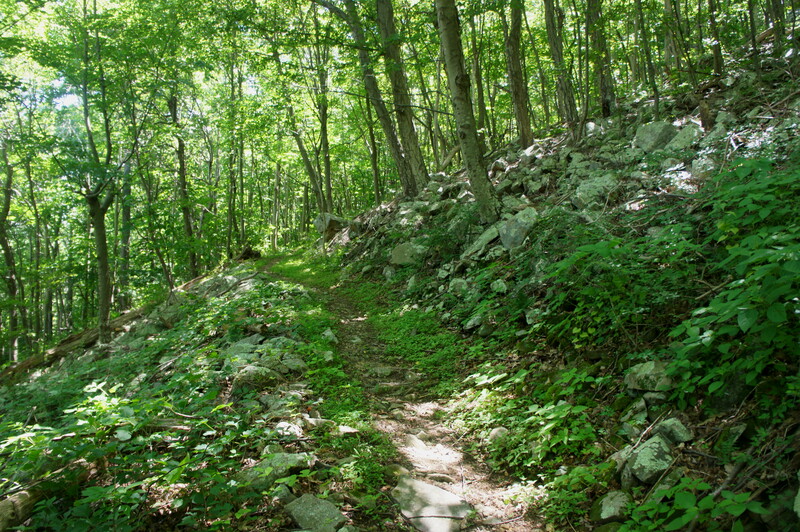 (Note: So does the Hickerson Hollow hike; choose the path to the right, which is the Dickey Ridge Trail.) Right on cue, the Dickey Ridge Trail climbs again, this time amid a sea of ferns. With oaks, poplars, and maples towering above, the hike skirts the rocky slopes of Carson Mountain (2,580’), where Dickey Ridge meets the much larger and longer Blue Ridge. As the hike approaches the 4-mile mark, notice the neatly arranged escarpment on the right is a feat of fine trail work. At 4.2 miles, the path forks. Stay right on the Dickey Ridge Trail as the Springhouse Trail—a bridle path—weaves off to the left. The sharp ascent finally comes to an end shortly thereafter. 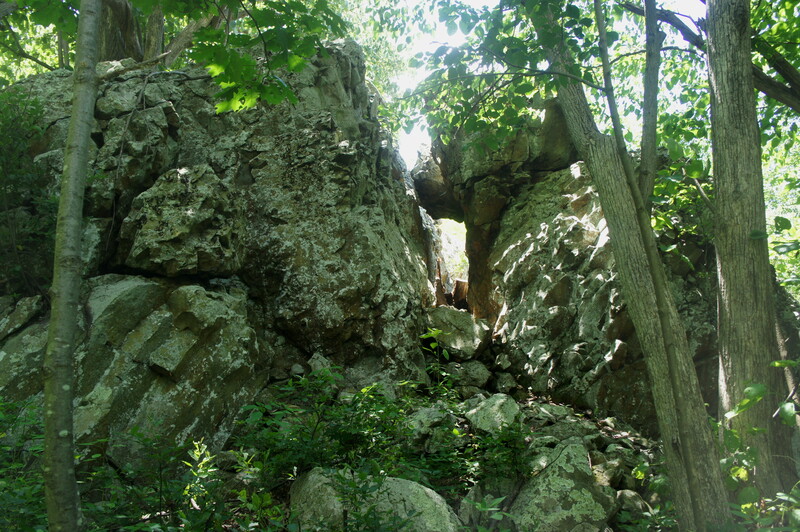 At around 4.6 miles, look for an unmarked path heading off to the left; this trail leads up to Fort Windham Rocks, a vast hunk of Catoctin greenstone that is an estimated 600-800 years old. 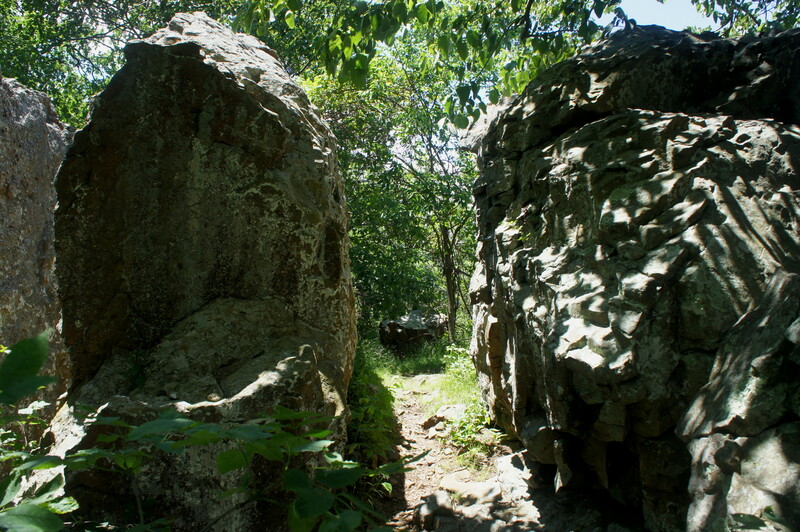 The rocks are fun and easy to climb; simply follow the path as it winds to the back of the formation, then climbs through a series of slits and cracks up the 30-foot rocks (the highest point on Carson Mountain). Views are limited, but the craggy granodiorite (the same rock that forms Half Dome in faraway Yosemite National Park) is an interesting sight to see. Returning to the main path, take a left to complete the final stretch of the Dickey Ridge Trail. 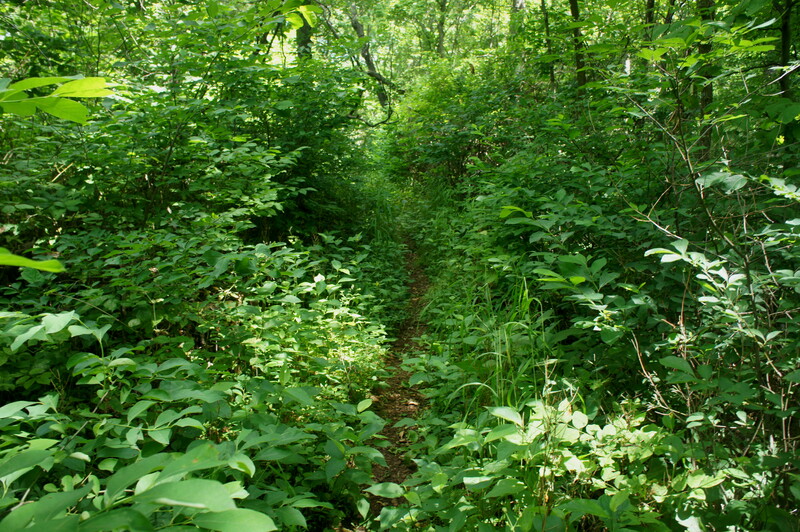 At around 4.75 miles, the trail ends at a wide, woody thoroughfare—this is a section of the Appalachian Trail. Turn around here, or continue right for a quarter mile to the parking area for Compton Gap, five miles from the start. Walk back the way you came—keep in mind, there is plenty of uphill on the return—or, if you are so privileged, get a pickup here. 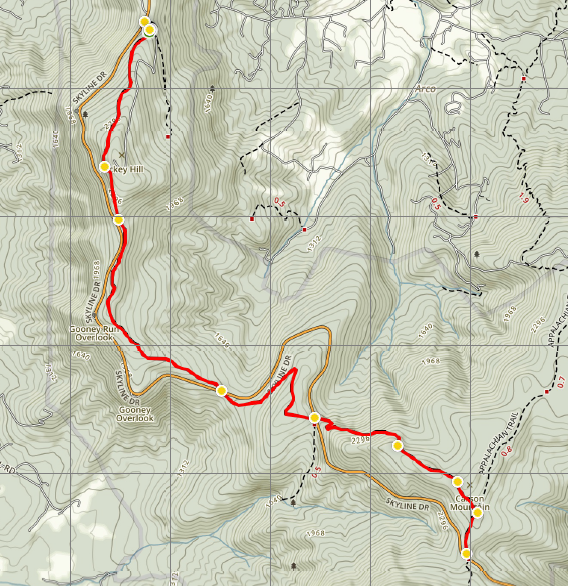 Try in combination with Dickey Ridge Trail – Part 1 for a 9.6-mile one-way slog, or split it in two. The entire second half as described here is a 10-mile out-and-back, a hike that will take most people much of a day. 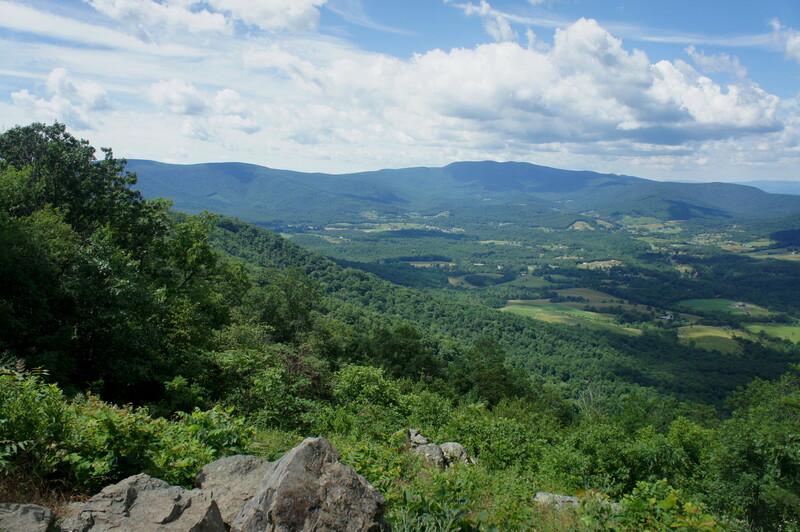 This entry was posted in Shenandoah National Park, Strenuous Hikes, Virginia and tagged Appalachian Trail, Carson Mountain, Compton Gap, Dickey Ridge, Dickey Ridge Trail, Fort Windham Rocks, Lands Run Gap, Low Gap, Shenandoah, Virginia. Bookmark the permalink.